This interactive presentation contains the latest gas (and a little oil) production data from all 7913 horizontal wells in Pennsylvania since 2010, through August. Total gas production from these wells made a small drop in August, but is still above 14 Bcf/d, and higher than a year ago. In August 86 new wells were completed, the highest number since almost 2 years (the average in 2017 has been ~60 / month). In the “Well quality” tab the production profiles are shown, averaged by the year in which production started. The thickness of the curve indicates the number of wells in a group. In the “Top operators” overview, you’ll notice that Cabot has overtaken Chesapeake again as the leading operator, as the latter has not grown production in this region in the past 4 years. As wells are fracked with record amounts of proppant, since Q4 2016 new wells peak again at higher rates. On average, these new wells are quite a bit behind those in the Haynesville (LA) though, which you may see in my post on that basin last week, although their decline is also slower (closer to harmonic, instead of exponential). 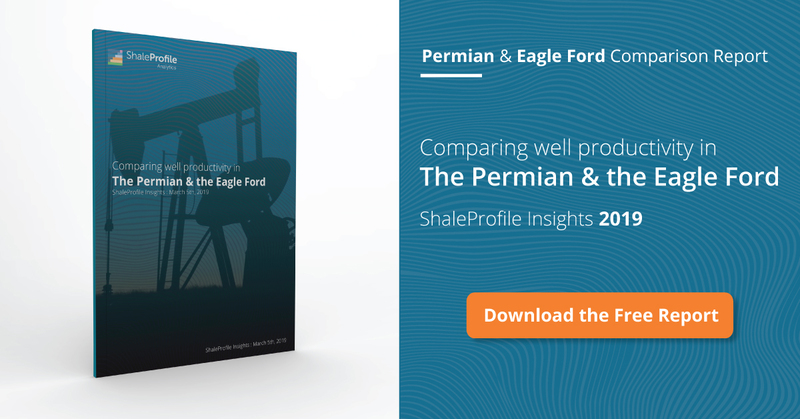 In the second half of next week, I will have a post on the Eagle Ford, followed by the Permian. As I now have access to pending production data as well, I’ll be able to show far more complete production data for Texas. It will be great if you could start a new tab for proppant volume used, per well and per 1,000′, if you have the proppant and lateral length numbers? I now plan to make a subscription service available in Q2 2018, next to keeping this blog. This additional service will include far more data and dashboards. For sure it will contain lateral length & completion data! I will tell more about this in the coming months. I may already ask for some help in discussing these ideas, and reviewing early versions, very soon. I hope that you, and other frequent visitors, would like to play a role in this! Must take a lot of time to gather and present all this data. Congratulations to you and best wishes in your ongoing efforts. At some point, perhaps a year or so down the road, it may become more clarifying for the targeted formations (Marcellus, Utica, Burket, Genesee, et al to be able to be identified (at least in Pennsylvania). While I am unaware of any presentations put forth by the PA DEP that would make this feasible, there is – nevertheless – a growing number of highly productive unconventional PA wells that are non Marcellus. EQT is drilling 80 Upper Devonian wells in 2017, including the near- unknown Geneseo – and the output is uniformly very high. EQT’s Geneseo well on the Pettit pad (note, Geneseo is distinct from the productive Genesee) has 1.3 Bcf in 99 days online, flowing at 13+ MMcfd on restricted choke. These results, along with the ongoing pipeline build out and cracker construction, lend confidence to projections of 40 Bcfd Appalachian Basin output by 2019. Indeed Pennsylvania is currently the state on which I have the least amount of detailed data. If you come across potential data sources, please let me know. I have found the site Marcellusgas.org to be an exceptionally data rich site for Pennsylvania unconventionals, even though it took me awhile to develop some familiarity with its useage. Typing in specific counties and using the search box (for Utica, Genesee, etc.) enables one to target specific formations on a county by county basis. This may become relevant sooner rather than later based upon Southwestern’s latest conference call. Seems like they have a 4 well Marcellus pad in Tioga flowing 80 MMcfd first 30 days. Tioga has been almost exclusively Utica past 2 years. Conversely, over in Washington county, they may have another monster Deep Utica, an area with almost all Marcellus. Early days in all this, but the distinction of specific formations should manifest more prominently down the road. Unfortunately it appears that no free bulk data is available for download there. If you, or anybody else, comes across a site where more well data is shared for Pennsylvania (e.g. formation, depth, bottom hole location, completion date), please share it with me, as I would be most interested! 40 BCFD — that’s already more than 50% of current US natural gas production! and double the current rate in Appalachian! Range CEO just said sweetspots are drilling out fast and little hope to see higher production there. I was starting with the 25Bcfd figure combining the Utica and Marcellus (Appalachian Basin) like the EIA currently uses. The Platts people project an additional 13 Bcfd pipe capacity by end of 2018, so – if completely utilized (not a certainty) – output would be in the 40 Bcfd range. There’s a few other issues the Platts folks may not have included, namely, the build out of several large CCGT power plants in the region as well as regional projects (Revolution Project, Ohio Valley Connector, WB Xpress, Buckeye Xpress). In addition, no one ever mentions the Mariner East 2 – and future ME 2X – which will ship 275,000 to over 500,000 barrels/day of NGLs to Marcus Hook. All of this might push to the upside of AB production. I read what the Range guy said (VP Farquharson) and would agree the rate of increase may temper somewhat, but these guys have several decades worth of great rock yet to drill. Quick followup to both mine and nu’s comment. Post merger with Rice, EQT plans to extend the length of their laterals to 12,000 ‘ Marcellus and 15/16 thousand foot Upper Devonian. All the operators in the unconventional realm are shooting for much longer laterals where possible as the costs can drop significantly by needing fewer wells overall. I did a simple calculation of the total amount of original gas in place (OGIP) and get some ridiculous numbers — hope to get some experts’ opinions. Example, Marcellus lateral length ~1,600m (~5,000′), and porosity 5% and pressure 400bar (~5,000psi, 1.4 overpressure gradient at depth of ~7,000′). If the fracking could simulate a rock volume of 1,000′ wide and 100′ deep, the total volume of gas (OGIP) should be 9BCF. Now, with quite a number of pre2015 Marcellus wells reaching EUR of 9BCF, are we talking about 100% recovery here? If we really have to increase the pressure in the nanopores and adsorbed amount to reduce the recovery ratio to 50% or less (which is already quite good for conventional gas wells), we have to admit the amount of OGIP is so large that it matches some of the best conventional reservoirs in the world. Strongly recommend you go to Range Resources website, go to Investors section, then Presentations. Download, open up, and go through the recent – December, 2017 – presentation, noting pages 51 through 53. They offer outstanding glimpses into what you are discussing. Yeah, there is a [Enno: adjective removed] ton of gas in the Appalachian Basin. thanks for the EXPERT advice, Coffeeguyzz! I looked at RRC PPT page 51-53, and seems to me that the Marcellus core’s Gas in Place (GIP about 120~150BCF/sq.mile, or 1.6~2BCM/sq. km) is close to my calculation above — my calculation shows for 30% recovery the resources should be over 3BCM/sq.km or over 200BCF/sq.mile. The Range numbers implies high recovery almost same as conventional resources. If they claim each mile long lateral well’s EUR is 9BCF and controls a width of 1,000′ (well spacing 1,000′), the recoverable gas will be over 45BCF/sq.mile, and this translates into recovery in the 30~38%! It’s quite efficient even when comparing with conventional resources! On the other hand, the numbers are still quite high given the depth, porosity and pressure as I calculated above. The over pressure gradient has to be >2.0, or huge amount of adsorbed gas to account for lower recovery. The 2/3/4.4 Bcf is per 1,000 feet, not per mile. Currently, these 9,000 foot long laterals are expected – and, seemingly, well on their way – to ultimately produce 30 to 40 Billion feet per well. But they are already doing it right now. When you have time, you might want to glance at the recent IR (Investor Relations) presentations from Cabot, EQT, and Antero … focusing on their EUR/mile of lateral. No one claims 9 Bcf. Cabot is up to 4.4 Bcf/mile. Most project 2 to 3+ Bcf depending a lot on dry gas (high) or wet/rich gas areas. BTW, the Fuling field in China and new drilling sites elsewhere also have encountered similar unexplained huge OGIP or EUR numbers. > BTW, the Fuling field in China and new drilling sites elsewhere also have encountered similar unexplained huge OGIP or EUR numbers. Are you by any chance aware of a way to access shale production data in China? Note: some of the Marcellus core area has thickness of much less than 100′ and still being able to put out 6BCF realistically. That means the amount of gas originally trapped is exceptionally high and so is recovery. These numbers could put the producible shale gas per acre into the same high side of conventional resources. I guess you are familiar with West Virginia University’s Utica study ‘A Geological Playbook …’. They pegged Utica OGIP at 3,000 Tcf, with recoverable at 800 Tcf, if I recall correctly. Comparable, in their opinion, to the Marcellus. Wrightstone Energy released a report a few years back on the Burket/Geneseo trend and put OGIP at 100 Tcf. yeah, I am familiar with such outrageous numbers from WV Utica playbook, also Penn State Prof. ‘s similar if not much larger TCF numbers. But, my calculation above seems to say such numbers or OGIP density per square mile is not feasible, at least by a factor of 2. OK, Enno. My ‘contrasting’ view as an American, an oil and natural gas producer, as someone that understands decline rates and well economics, is that “promoting” unconventional resource abundance encourages its use and creates a false sense of security in my country. It is the wrong message. And a dangerous one. The message should be one of moderation, of fiscal responsibility for the sake of price stability, employment stability, a healthy oil and gas industry and encouragement of conservation of our remaining resources. There is nothing that I see in your realized production data presentations, I repeat… nothing, that even remotely suggests America is on its way to hydrocarbon independence. The debate here on your blog, I would hope, would not be one of talking up E&P stocks but one of concern for our long term future. My industry, even little ‘ol me, has a fiduciary responsibility to tell the truth about that future, to remind folks that the easy stuff is long gone, and the hard stuff, like shale oil and shale gas, is going to come at an enormous cost to society. Statistically American’s have very little in their savings accounts, are not prepared for retirement, and pretty much live hand to mouth. It will be a great tragedy for us to not have “saved’ any hydrocarbons for our children. Let’s keep the debate here civil and not personal. I value both of your views, and I think it’s important to have contrasting views in order to get a better picture on what is actually happening. Thank you both for your contributions here. I am actually sitting a drilling rig at the moment, Gerard. I don’t recall you and I ever meeting; whatever you imagine my personal life to be is irrelevant and a distraction from false claims of decades of shale gas abundance. Or is it centuries? Long laterals and how much sand you can stuff into a stinking shale well might be of interest to you but you must not confuse, over and over again, productivity with profitability. The two are not the same. For the shale phenomena to be sustainable it must become, and STAY, profitable, pay down ALL of its legacy debt and then learn to STAND on its own two financial feet. Without credit. Then and only then can America count on unconventional shale resources for part of its hydrocarbon future. Brown paper bags can help with that, by the way. Hope you are enjoying your quasi retirement, more time on the tennis courts, and – best of all – soon-to-be $60+ WTI. I’ve just read that report and it addresses my planned response to ol’ nu up thread … namely, the Appalachian Basin sweet spot. Real potential to economically develop an incredibly large area. In addition, that report only mentioned the 2,100 square miles in Greene, Washington, and Susquehanna counties. Including Bradford, Lycoming and Wyoming, the productive area enlarges dramatically. Neither West Virginia’s counties – nor Ohio’s – were even included. Chesapeake’s McGavin 6 is in Wyoming county and – in 64 days online – flowed over 3.25 Bcf. Sweet spots will be exhausted someday … few decades hence, perhaps.